If you are looking to build a deck to have decks for each color combination, you immediately notice that your options in RW are limited . Most generals are well suited to a very straight-ahead aggro approach (Agrus Kos, Wojek Veteren, Aurelia, the Warleader, Jor Kadeen, the Prevailer and the recently printed Anax and Cymede) where the primary difference is how you want to exploit your general's abilities to pump an army of dudes. You also have Brion Stoutarm (a general well suited to teaming up with every Threaten variant ever printed), but that doesn't particularly interest me either. I'm sure there are plenty of fine decks out there that have these creatures at the helm, but none of them excite me to want to build a deck around them. On the other hand, Gisela, Blade of Goldnight has rules text that makes most other Legendary Creatures blush with shame and have a nagging feeling of inadequacy in her presence. Doubling all the damage you deal while halving the damage dealt to you by your opponents is a nice set of abilities. 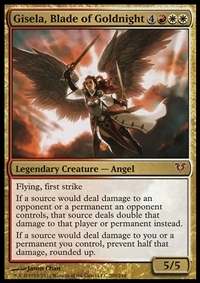 To me, the only things really holding Gisela back are a) her 7-mana converted mana cost, b) the fact that she is red and white which many people consider the two worst colors in EDH, and c) there are no built-in "I win" combos with her abilities. If you look at these drawbacks as more of a challenge, Gisela has the potential to be a sweet deck. This deck didn't start out as a "burn" deck, but it has slowly developed into one. With 18 cards that deal direct damage, the deck loves throwing its cards at opponent's life totals. Of course, in a multiplayer, 40 life environment, such a strategy would fail miserable if it was not supported somehow. Through various card advantage themes and other support cards that allow our burn spells to do more, we can overcome the inherent weakness of burn cards. I feel like the deck runs all the best low-costing burn cards. I tried to choose only ones that could be played with Sunforger, with special consideration for ones that could also be played with Isochron Scepter as well. EDIT: Isochron Scepter has been removed from the deck for not really performing as well as I hoped. This is probably the defining theme of the deck. Cards like Fire Servant, Gratuitous Violence, Furnace of Rath, and of course Gisela herself are there to increase the effectiveness of the burn cards, incidental damage caused by creature triggered abilities, and combat damage. When unanswered, these cards make sure you have enough reach to close out a game. Pyromancer's Gauntlet also falls into this category, although it only deals an additional 2 damage. There are some other cards that can also double damage in Curse of Bloodletting and Quest for Pure Flame, but neither are good enough due to their limitations. Sulfuric Vapors is half the damage of Pyromancer's Gauntlet for only one less mana. The deck uses Stoneforge Mystic, Stonehewer Giant, and Godo, Bandit Warlord as equipment tutors. The deck plays 3 swords (Fire and Ice, Feast and Famine, and War and Peace, Umezawa's Jitte, and Sunforger. SoFI and SoWP have the nice side benefit of granting pro-red, allowing me to choose which creatures will survive the many mass-damage red spells the deck runs, but between all of them I can grant my creatures the protection of any color I may need to force through damage or protect a key creature. If I had more room in the deck, I would also want to run either Batterskull or Skullclamp. Sword of Light and Shadow is tempting, but I don't think this deck is set up well to take advantage of either ability. EDIT: The equipment package has changed a lot as the deck evolved. The deck doesn't run a lot of creatures, so I needed to cut one. I also cut Jitte and SoFaF and added Skullclamp instead to give the deck a little more long term card advantage. With the equipment theme set, running a Sunforger package seemed like a logical next step. The deck runs 13 different instants of CMC 4 or less for Sunforger targets, most of which are burn cards. The deck runs 10 different instants of CMC 2 or less for Scepter, almost all of which are burn cards. This is one area that I think the deck can improve on. Cards like Oblation, Return to Dust, Debt of Loyalty, or Wild Ricochet all seem like good cards to possibly include but for lack of space. I'm also wondering if I should drop Scepter altogether. It would allow me to upgrade Disenchant to something better and I can run something else. The deck includes 4 Red Burn based sweepers that combine with Mogg Maniac, Boros Reckoner, Spitemare, and Repercussion to put the hurt on your opponents while also introducing a nice bit of creature control. Satyr Firedancer works as an inverse Repercussion, but the effect is very much the same; get double/triple duty out of your burn spells. Firestorm also works very well in combination with these cards. If I wanted to extend this theme, the next cards to include would be Stuffy Doll or Pariah, but I have cut these due to their limitations. Another X-spell like Comet Storm would also go a long way. There are many cards that synergize well with the playing of lots of cheap instant and sorcery cards. Young Pyromancer, Guttersnipe, Chandra's Spitfire, Galvanoth, Blaze Commando and Charmbreaker Devils all thrive in this kind of environment. I would also include Mirari in this category as well. I sadly had to cut Kiln Fiend, but if I can find a way to sneak it back in I will. Chandra's Phoenix proved not very good for a similar effect. Sphinx Bone Wand is another really good card that I only cut due to its high CMC. Basically, if there is a way to get in some extra bits of damage through doing something I would normally want to do, it made it into the deck. Inferno Titan, Warstorm Surge, Purphoros, God of the Forge, Hellrider, and Balefire Liege all fall into this category. These effects really add up over time and are especially good at triggering other effects in the deck. My original incarnations of this deck had a lot more of these kinds of cards, but they were all symmetrical effects. I have since cut all of these cards. Some of the better ones are listed in another section below. Invader Parasite has struck me as a card I think I want to include, but I'm unsure what it might be better than at 5 mana. I think I may also want to try Tunnel Ignus. EDIT: Warstorm Surge and Inferno Titan eventually got the axe. They are both excellent cards, but the deck needed the space. The deck used to include cards like Ankh of Mishra, Zo-Zu the Punisher, Pandemonium, Manabarbs, Burning Earth, Sulfuric Vortex, Spellshock, and Dingus Staff to help pile on repetitive damage with little mana investment. These cards are effective at shortening the game and getting your opponents into range of your other damage spells. The issue is that when you start looking at what is available to you these cards start to pale in comparison, and their symmetrical nature can be a big detriment once the table realizes what you are up to and starts to go after you. If you are interested in these kind of effects, there is also Coalhauler Swine and Cosi's Ravager. Utilizing Goblin Bombardment and Blasting Station to trigger Vicious Shadows, Stalking Vengeance, Goblin Sharpshooter, Hissing Iguanar, or Rage Thrower can prove very profitable. With Vicious Shadows and Stalking Vengeance costing 7 mana, I ended up cutting this suite of cards altogether to cheapen the average casting cost in the deck. Fork, Reverberate, Reiterate, Wild Ricochet, Increasing Vengeance, and the -2 ability on Chandra, the Firebrand can all get good mileage here, but I've found that these cards just aren't worth it. It may be okay to include one to use with Sunforger (with Wild Ricochet being the best), but overloading on these cards is definitely not the way to go. At one point, I also had all the Ball Lightning variants in the deck, including Hellspark Elemental, Blistering Firecat, Sparktrooper, Hell's Thunder, Elemental Appeal, and Zektar Shrine Expedition. These were great for triggering Pandemonium and Warstorm Surge when they entered play, Vicious Shadows and Stalking Vengenace when they died, and they were quite good with the damage doublers. When I started to explore a more spell-based theme, these became a casualty of deck space. So that's it. I'm hoping for some input, especially on things like Sunforger, Isochron Scepter, and some other cards that I may have missed. Are you Daretti for this?!? 1. I don't see many methods for you to draw more with this deck, which I find concerning from my experiences with RW decks. I would try to make some room for some card enablers like Anvil of Bogardan or Staff of Nin to add a little bit more of draw besides the spell based ones you already use. 2. Since you're going Gisela, is there a reason you do not have Heartless Hidetsugu in your deck? With Gisela in play, you will one-shot any of your opponents that have an even-number life total or put them at one life if they have an odd-number life total. 3. I feel like your creature count is a little low to justify Warstorm Surge. A lot of your creatures are also small in power, so I wouldn't think this card would contribute much during late game. Purphoros, God of the Forge also falls into this same issue from my end. He probably could do 4 damage sometimes, but he feels against your overall strategy. If you really like him, I would include at least a Siege-Gang Commander to allow more procs and also extra burn by sacrificing the tokens away. 4. I honestly don't see a strong reason to include Isochron Scepter in your deck. Besides needing to being lucky enough to draw into it and an instant in your hand, you only have 12 instants that could pair onto it and some of those instants would be a weak to pair onto it (Firestorm being the worst of all). If it was in my play group, the scepter would be destroyed after the first use most likely so you'd effectively get two-for-one'd. 5. Similar to the above point, Commander/EDH has always been a game about cards needing to scale. Obviously, Gisela helps, but I find the cheap burns that only do damage - Lightning Bolt, Chain Lightning, Lightning Strike, Searing Spear, and Volcanic Hammer - to be very weak on their own. I would definitely go the more X damage route with Comet Storm, Fireball, or Chain Reaction to get a lot more bang for the mana commitments. If you want instant speed abilities still, Soul's Fire is way stronger in damage potential than some of those burns you use so I would find a home for it. 6. You already commented on the copy effects, but since you run so much burn I would argue Increasing Vengeance is absolutely worth it. With the flashback, you can get some crazy damage output. The deck uses 3 'Wheel' effects (Wheel of Fortune, Reforge the Soul, and Memory Jar) in addition to the 2nd ability on Chandra Ablaze, playing additional spells via Sunforger, Galvanoth, or the 2nd ability on Chandra, Pyromaster. recursion of spells via Charmbreaker Devils and Past in Flames, and copying spells via Mirari. Godo, Stoneforge Mystic, and Stonehewer Giant also fetch equipment as part of their abilities (one of which is Sword of Fire and Ice). There is a lot more card advantage in the deck than it first appears. With that said, I'm always wanting to get more card advantage into the deck. I have considered running Mind's Eye and Skullclamp, both of which are on the shortlist of things to come into the deck. I'm not a fan of Anvil of Bogarden as it doesn't generate any actual card advantage. I would consider Staff of Nin as I actually like the card in my Bosh deck right now. It's also a one-shot kill with Furnace of Rath or Gratuitous Violence. I guess I left it out (along with Malignus and Quietus Spike) because of their one-shot nature. It's also the reason I don't run Restoration Angel or Zelaous Conscripts to go with my Kiki-Jiki. I agree the creature count is a tad low. I have been considering removing Warstorm Surge due to its mana cost and the fact that its really more of a leftover from when the deck ran the various Ball Lightning variants. Purphoros will probably stay because its cheaper, has another ability, and also combos with another card I intend to add in Kher Keep. I have been wanting to add in some creatures like Duergar Hedge Mage or Brion Stoutarm, so perhaps this frees up a slot to do so. This is indeed a problem. I've been wanting to cut it anyway so that I can dump cards like Disenchant for Orim's Thunder. The issue is mana; the deck doesn't generate a lot. I like Chain Reaction as another cheap sweeper, but I don't know if I would play another X-spell in the deck. Comet Storm and Aurelia's Fury would be my top picks to add if I did, although I am also a fan of cards like Fault Line. As for the smaller burn spells, they are often used as creature removal in the early game while the deck sets up so they are rarely dead cards. I am usually holding on to them until I can make sure that I get maximum value from them through come sort of other effect, so its rare that a Lightning Bolt is "just" 3 damage. I understand that traditionally, burn cards are considered underpowered for the format and I would tend to agree with this. However, this deck is assembled to make them worth it. I agree that Increasing Vengeance is an awesome card, but I think I'd run Wild Ricochet first. Increasing Vengeance also may end up being better than Past in Flames for this deck due to the mana restrictions, so this is definitely something I'll watch out for. I appreciate the input and suggestions. -1 Char, +1 Chain Reaction - Good suggestion and Char is the weakest burn spell I run. -1 Past in Flames, +1 Wild Ricochet - I might also try Increasing Vengeance here as well. Stoke the Flames: One of the better burn spells to come out in a while. Dictate of the Twin Gods: Fits right on theme and is an auto-include for what this deck wants to do. Armillary Sphere: The deck needed a bit more ways to ensure it hit its lands drops. Hostility: I don't know how this got removed from the deck to begin with, but its back now. Inferno Titan: Too expensive for too little effect. Warstorm Surge: Awesome card that just doesn't do enough in this deck to justify the cost. Wild Ricochet: I'm becoming less and less of a fan of this card. Sword of Feast and Famine: I know this seems like blasphemy, but the deck had one too many equipment cards for my liking. I liked the ones that gave pro-red over this, even though the mana boost was very welcome when the creature connected. So I'm definitely finding a place in the deck for Monastery Mentor from Fate Reforged, but I'm wondering if there will be other prowess goodies worth running. The only other one I've even considered was Dragon-Style Twins due to double strike, especially given that Prowess triggers off a whopping 43 cards in this deck. I think I may shave a land to put it in, going down to 35 lands and 4 mana rocks, but I'm wary of going below 36 in a deck that can't ramp with green spells. I've got a Gisela, Blade of Goldnight deck that I play, which takes a similar route to yours, albeit with many fewer creatures. Personally, I find that for multiplayer applications, symmetric burn has beneficial political aspects. Mind you, my deck is rather budget-ish (for EDH, anyways) so I lack some of the firepower you've got happening. Anyways, I find Arcbond to be very effective, especially when you have a way of shielding yourself - Personal Sanctuary - for example. I get the dropping of the symmetry, though, as it's likely to kill you as it is to kill them. Depending on how the deck plays for you, well, I was going to suggest something like Æther Flash but it kills too many of your things to be helpful I think. Maybe you have tried this, for me I find that dealing damage in multiple instances of 1, as with Pyrohemia is great with Gisela, Blade of Goldnight. Lastly, for putting the screws to the opposition while keeping you afloat, there's always True Conviction. Just thought I'd chip in my 2 cents. You seem much better versed than I, so I might not have been that helpful. Goblinslide - This was fun to try out here. The tokens feed things like Purphoros, God of the Forge, Skullclamp, they can pick up a Sword and bash, etc., but overall the 1 mana payment ended up being a little more than the deck wanted to spend for the effect. Howl of the Horde - Getting raid is no problem, but getting to a spot to play this and a spell worth copying in the same turn if difficult. Outpost Siege - I really like this card and I'm using it in a few decks, but it felt out of place here. Exquisite Firecraft - 4 damage and can hit both creatures and players. Even though its a Sorcery, it fits in perfectly here. Pyromancer's Goggles - The didn't need another 5-drop artifact, but this ended up being better than I though it would be. Fiery Confluence - This will default to 6 damage to target player most of the time, but the flexibility is awesome. Meteor Blast - Getting 4 damage to 1 target for 4 mana is not bad, but getting 2 or 3 targets for 5 or 6 mana makes this very good. Mizzix's Mastery - I tried this to figure out how often I get to 8 mana to Overload this. It didn't happen enough to warrant inclusion. Chandra, Flamecaller - I've wanted to find a place for this, but this isn't really it. Archangel Avacyn - I tried it here because it fir the color identity, but it doesn't fit the deck. I moved it over to Zurgo instead. Flameblade Angel - Great effect tacked on to a nice 4/4 flying body, but its just a tad too expensive to run here. Nahiri, the Harbinger - Removal, looting, and tutoring all wrapped up into a nice package. A welcomr addition even if I'm not cheating in Eldrazi with it. Collective Defiance - Being able to hit a creature and a player makes this worth running, not to mention that you can sometimes use it to either cycle away some uncastable or useless cards or deck Mr. "I just drew 40 cards" guy. Nahiri's Wrath - The deck doesn't usually have many cards to throw away, but this clears the path and deals a ton of damage when you have some high-CMC cards stuck in your hand. Well worth it. Shreds of Sanity - I'm always trying out ways to sneak in CA into the deck. Nada - I made a note to try out Grenzo, Havoc Rider but I never did. Chandra, Torch of Defiance - You basically want to be +1-ing this over and over until you can hit the ultimate. Great card. Harsh Mentor - The fact that it only hits opponents, and it shocks them for every Fetchland, Sensei's Divining Top activation, and any other non-mana activated ability makes this a very consistent and cheap source of repetitive damage. Insult//Injury - Insult is on-theme as a damage doubler, and Injury is at least passable at 4 mana. I'm not sold on its long-term viability, but it seems interesting enough to try. Hazoret the Fervent - 3-mana Shock isn't great, but it hits all opponents and is attached to a 5/4 Indestructible Hasty God once I get nearly hellbent. Seems interesting enough to at least test. Oracle's Vault - Of all the various card-draw artifacts, this one is rather intriguing. I think that of all the places that might want/need card draw, this looks like the most promising place for a card like this. Throne of the God-Pharaoh - I'm not sure I'm running enough creatures for this, but free recurring damage sources are always welcome. I notice the deck runs a lot of high value artifacts to ensure that Gisela can be cast and recast if need be. How do you recover from mass artifact destruction? Would you run Scrap Mastery? With only 13 artifacts in the deck, Scrap Mastery wouldn't do enough to justify a slot. It's a great card; I run it in my Bosh deck where I have 46 artifacts and it is awesome in that deck, but here I might see 3-4 artifacts in any given game so mass-artifact kill doesn't really concern me. How you do you keep up the mana for keep re-casting Gisela? When I used to have a Gisela deck, my biggest problem was always that I'd cast her, and she'd immediately die. Getting to 7, then 9, then 11 mana in RW is hard. I learned very early that trying to ramp up the mana was a losing proposition for a deck like this, so I cut everything that was 7+ mana, drastically reduced the number of X-spells that I run, cut most of the artifact ramp, and relied more on having a good mana curve versus trying to beat green decks at their own game (which you can't). What ends up happening is that Gisela is the only 7-drop I run and she is a late game card at best. The rest of the deck is built to essentially function without her, so casting her for 9, 11, etc. mana is rarely necessary. If I wanted to play Gisela more, I would want to add Mind Stone, Everflowing Chalice, Burnished Hart, Solemn Simulacrum, Coalition Relic, Worn Powerstone, Hedron Archive, and Gilded Lotus to ramp up the mana production significantly, plus a few more cards that help protect or combo with Gisela like Pyrohemia, Swiftfoot Boots, Lightning Greaves. At that point, I would be more wary of running out tons of artifacts and getting blown out by Vandalblast, so I would be changing a lot of what is in the deck as well as how I play it. I think that's a perfectly fine way to play Gisela, but its just not how my deck plays out. And full disclosure; this deck is one of the weaker decks that I have. It's more of a challenge deck; can I make an EDH burn deck? When it works, it works fairly well and can hold its own as people aren't normally prepared to deal with tons of burn taking out their utility creatures and you can get in a lot of damage while other players are durdling. Whene it doesn't work, its for the exact reasons that you would expect; RW has issues with generating mana, card advantage, and game-breaking effects. It's actually a very cool concept! Have you considered running more wheels, such as Wheel of Fortune or Magus of the Wheel? I know red white are definitely colors that are lacking in draw, so I usually try to run wheels where I can if I'm playing Boros. I'm already running Wheel of Fortune, Reforge the Soul, and Memory Jar. Wheel of Fate and Magus of the Wheel have shown to not be good enough in my opinion. My bad, I didn't see the Wheel of Fortune and Reforge the soul in the sorceries and instants list. On another note though, I'm glad to find a fellow Bolt player in EDH! It's a great card and I run it in all of my red decks. What do you think about Amonkhet cards, such as Insult // Injury? I'm currently running Harsh Mentor, Insult // Injury, and Hazoret the Fervent. I pulled Kiki-Jiki, Mirror Breaker, Pyromancer's Gauntlet, and Hellrider to fit them in. Insult // Injury specifically has gone back and forth between being really good and just being okay, but it does play very well with the all the other synergies in the current configuration so I'm sticking with it for a while. I'll update the opening post. Leave//Chance - This is an interesting take on a card drawing spell, but ultimately I think there are better options. Firebrand Archer - Getting in free damage for each non-creature spell adds up over time, and the deck can definitely use another 2-drop. Imminent Doom - So I run 7 1-drops to get this up and running, which I worry is not going to be enough. After that, I think I would have plenty to keep it rolling along (13 2-drops, 14- 3-drops, 11 4-drops, 9 5-drops, 4 6-drops, and Gisela at 7 mana with some X-spells that can help after that). Neheb, the Eternal - This was the one place I was most excited to see Neheb in action. In the end, I went with Neheb, the Eternal and Firebrand Archer in place of Hazoret, the Fervent and Nahiri, the Harbinger. Doing another update, I've had some interesting cards to look at for this deck. Angrath's Marauders - So the effect is exactly the kind of thing that this deck wants theme-wise, but the 7-mana CMC is an issue. I've been trying to keep everything in the deck to 6 mana or less with Gisela herself being the only 7-drop, but perhaps I might need to relax that restriction to include this. Primal Amulet/Primal Wellspring - I'm a fan of everything this card can do for this deck. It acts as a mana rock, then turns into mana+spell copier, I think I need to find a way to keep this card in the deck. Rampaging Ferocidon - Shutting down lifegain is a nice touch, but I like punishing players for putting creatures into play. Repeating Barrage - I mention this only to point out to people that Hammer of Bogardan exists and it is better, but still not good enough. Star of Extinction - Again, 7 mana would be the only thing holding me back from running this. The LD is relatively incidental, but 20 damage to each creature is amazing. I may have to extend the 'dealing damage to my creatures' theme again and put Repercussion back into the deck and find room to add in Stuffy Doll. Sunbird's Invocation - I really want to find a home for this card, but I'm not sure that this is the place. Vance's Blasting Cannons/Spitfire Bastion - I'm considering this as a potential replacement for either Outpost Siege or Mind's Eye as a way to generate card advantage. Path of Mettle/Metzali, Tower of Triumph - I briefly considered how I could make this work and decided that it really wasn't worth it. Pirate's Pillage - I like the package of card filtering with a little mana production. I decided that for now, I'm going to go +1 Angrath's Marauders, +1 Primal Amulet, -1 Mind's Eye, -1 Insult//Injury. Fight With Fire: Unlike a lot of my other decks, this one is not short on cheap removal and in need of a strong finisher. I'll pass here. Firesong and Sunspeaker: So the deck already runs both Lightning Helix and Warleader's Helix, and it would be easy to potentially slip in Righteous Confluence, Blessed Alliance, or Energy Bolt, but I don't think the payoff is good enough for so little support. Jaya Ballard: I really like the idea of running this, but I need to be careful about filling the deck up with too many 5+ drops. Jaya's Immolating Inferno: With only 2 Legendary creatures, 1 (potentially 2) Planeswalkers, and Gisela, I don't think this is a viable option. Karn, Scion of Urza: I want to run this just to be able to draw cards off of it, but I don't think that this is a good fit for the deck. The Flame of Keld: When I read a book, I like to skip to the middle and start reading, so can I start on Chapter II and finish up on Chapter III and just skip Chapter I??? It's fine with Memory Jar or as the last card you play out of your hand, and I think that if it was an Instant/Sorcery I would definitely play it. As an Enchantment, it doesn't have the same level of synergy with the spellslinger cards in the deck. So I think that at this point, I want to try Jaya Ballard in place of Molten Disaster and see how that plays out for a while. I also put in Acidic Soil as it was suggested to me in my decklist thread. I took out Armillary Sphere to sqeeze it in.